I’m going to sound like a broken record when I tell you that, as a kid, all I wanted in the world were terrible-for-you foods. Unfortunately, the only thing fun my mama was willing to buy us were frozen pot pies. I took what I could get! I loved the flakey crust and rich filling. The overly cooked peas and carrots…not so much. 1. Schmaltz. Yassss!! This crust is special. Instead of butter (you can totally use butter if you don’t have schmaltz) I used schmaltz and it resulted in a really delicious, more crumb-like, very chicken-y crust. Oh man. I like it a lot! I can’t help it. I’m just not a huge fan of Valentine’s day, but over the years I’ve realized it doesn’t have to be a lame holiday. There are tons of ways to have a perfectly enjoyable Valentine’s Day without it being dumb and annoying. First step: Don’t buy champagne (grocery stores usually mark it up during V-Day anyway). Drink a pét-nat instead. Or beer. I love beer. Third step: If you’re going to buy the cheesy candy from the drug store, buy it the day after when it’s 50% off. Duh. McCormick sent me an email and asked me if I’d be willing to take on their Go4Gourmet challenge of creating a dish with four secret ingredients. I love a challenge and I would consider myself a bit of a competitive person. In third grade I “accidentally” tripped this girl in a derby race. I’m not proud of that moment but I did win. So, I said yes. 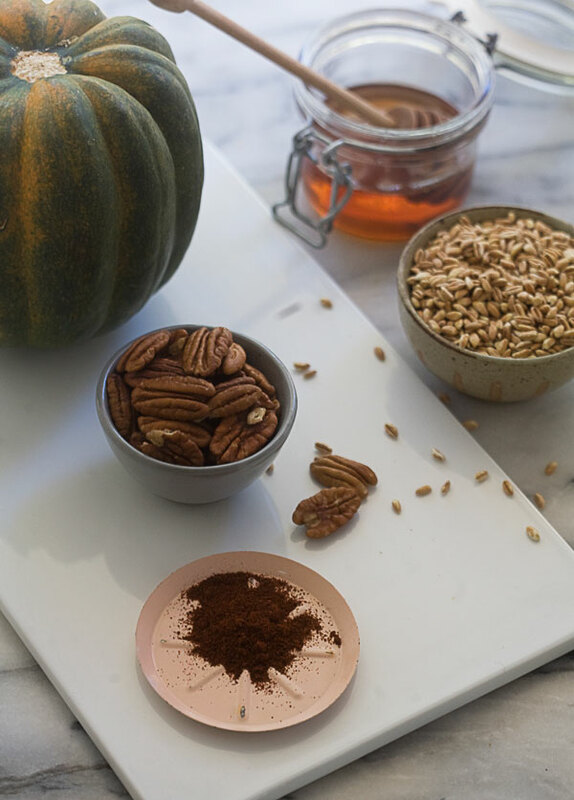 When I found out the ingredients (acorn squash, pecans, honey and chipotle chile pepper), I was pumped. In my brain I loved the combination of spicy, smoky, sweet and crunchy and nutty. Perfect combination of flavors. And I knew exactly what I wanted to make. I’ve been wanting to make acorn squash boats for forever!